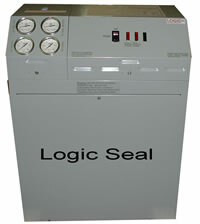 Chillers, Inc. is proud to offer Negative Pressure Units from Logic Seal. The Logic Seal unit is superior over all other Negative Pressure units available, as we have a High Vacuum Control Circuit that helps reduce wear and tear on parts, and a Cyclone Separator on our units 24 GPM and up, providing the best Air Separation possible. Negative pressure units work with your central plant chilled or tower water to covert positive pressure from these systems to negative pressure within the cooling channels of the mold. Negative pressure allows air to enter the cooling channel to prevent water from leaking out... air is vented from the unit through an automatic purge device. STANDARD DIMENSIONS: (HxWxD) For LS-100, 300 & 400 models: 28"x24"x14"
STANDARD DIMENSIONS: (HxWxD) LS-350 & 500 models: 28"x36"x14"